It may not take much to establish a healthy eating pattern. Making small tweaks to your daily menu can keep you in good health. You may just need to make minor changes to adopt a healthy eating pattern. The Dietary Guidelines for Americans 2015-2020 offers a clearly defined blueprint that provides guidance on portion control and types of foods that keep you healthy. 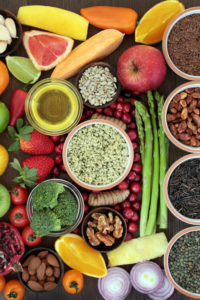 If you’re serious about maintaining good health as you age, use the recently updated Dietary Guidelines for Americans 2015–2020 as your blueprint. The publication (available as a free download by clicking here) offers a healthy eating pattern designed to reduce obesity and prevent chronic diseases like type 2 diabetes, hypertension, and heart disease. All have been trending upwards in the past few decades, and all increase your risk for disability and premature death. The 2015-2020 Guidelines focuses not on individual nutrients or foods in isolation, but on the variety of what people eat and drink. Overall, you are advised to focus on nutrient-dense foods and to pay attention to the amount you eat (meaning, keep an eye on portion control). If you don’t already eat healthfully, Grossman recommends that you make small shifts in your current habits to reach the daily targets listed below (which are based on a 2,000 calorie-per-day diet), rather than a complete change that might be hard to sustain. A half-cup of dried fruit is equivalent to 1 cup of fruit, but watch your intake, since dried fruit also is higher in sugar and calories than fresh whole fruit. Fat-free or low-fat dairy: 3 cups. This category includes milk, yogurt, cheese, and/or fortified soy beverages. “If you drink full-fat milk, switch to a one or two percent version, since this will ensure you get all the nutrients without the saturated fat present in whole milk,” Grossman says. “Also select low-fat or part-skim cheese, but check the sodium content.” When preparing meals, substitute low-fat yogurt for sour cream, and low-fat ricotta cheese for cream cheese. “Low-fat yogurt is also a tasty replacement for sour cream on a baked potato,” Grossman adds. To make up your daily intake of dairy, keep in mind that 1 cup of milk, yogurt, or soymilk (soy beverage), 1½ ounces of natural cheese, and 2 ounces of processed cheese can be considered as 1 cup from the dairy group. Protein: 5½ ounces. Ensure you get your protein from a variety of food sources, including seafood, lean meats and poultry, eggs, legumes, soy products, and nuts and seeds. Foods from the dairy group also are a source of protein. 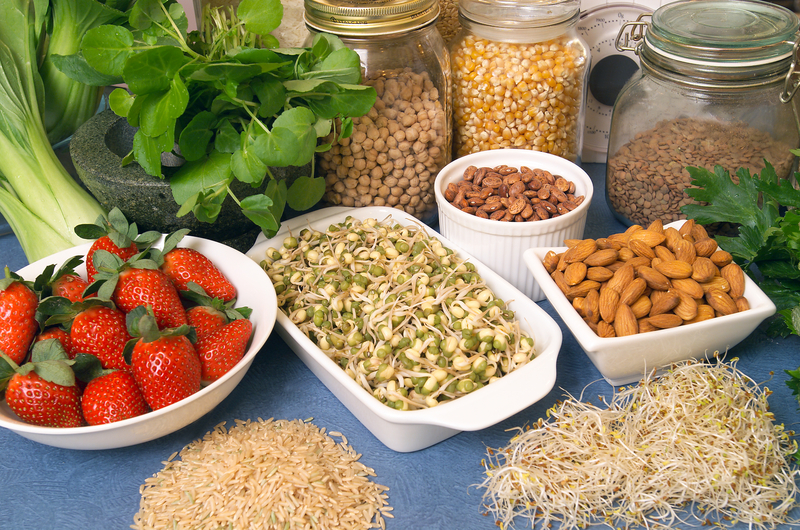 Keep in mind that a half-ounce of nuts or seeds counts as 1 ounce-equivalent of protein foods. “Nuts and seeds are high in calories, so stick to small or measured amounts, and choose unsalted options,” Grossman says. Also consume at least 8 ounces of seafood per week. Less than 10 percent of your daily calories from added sugars (sugars and syrups that are added to foods or beverages when they are processed or prepared, but not sugars that occur naturally in fruits and milk). Less than 10 percent of your daily calories from saturated fats. Check the nutrition facts label on packaging to gauge how high foods are in saturated fats—some high-fat examples include butter, whole milk, and meats that aren’t labeled as lean. Less than 2,300 milligrams (mg) per day of sodium (the American Heart Association recommends an “ideal” limit of 1,500 mg). Studies suggest that the average American consumes more than 3,400 mg per day. Check the the nutrition facts label to monitor the sodium in processed foods like pizza, pasta dishes, sauces, and soups. If you regularly eat out, select low-sodium options or ask for meals to be prepared without adding sodium during the cooking process. 2 diabetes, add, breakfast, calories, carrots, coconut oil, cooking, corn, dairy, diabetes, diet, dietary guidelines, dietary guidelines for americans, ed, fiber, food, good health, health, healthy eating, healthy fats, heart disease, hypertension, low fat dairy, milk, nutrient dense foods, nutrient density, nutrients, nutrition, nutrition facts, nutrition facts label, nuts, obesity, portion control, processed foods, protein, quinoa, refined grains, smoothie, soy, sugar, type 2 diabetes, vegetables, whole grain, whole grains, yogurt. More dairy than vegetables completely discredits your whole recommendation. Can we not get away from this and move forward? Please site a 3rd party non biased study that has not interest but the science to show that dairy will actually improve health and is necessary….